We have a dedicated team of analysts working with the data in detail to produce understanding and real insights for our clients. We produce discreet, bespoke reports which place the client’s online conversations in the context of their business objectives. We consider our clients to be partners and work with them to better understand their business and their business environment. The modern internet can be a jumble of news, pictures, posts, likes and retweets published by users who are sharing and shaping their opinions online. 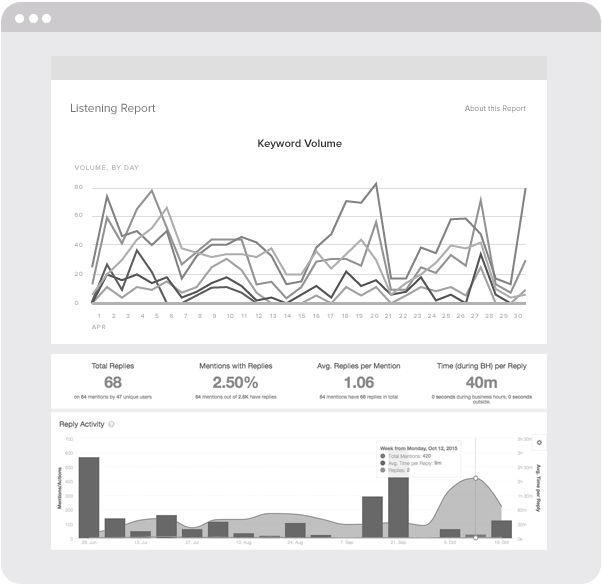 Through the processes of social listening and media monitoring, Getclosure cuts through the noise to collect comments and opinions from the public web that are relevant to brands, organisations or industries. Getclosure packages these insights into clear, understandable formats that enable clients to understand what the conversation is about. GetClosure has been working with us at MultiChoice for many years – their reports form an integral part of our ongoing communication analysis and planning. They are masters at keeping their finger on the pulse of our business, and at alerting us of developing conversations on social media. This helps us to manage issues timeously before they evolve into a crisis. The team ensures they are familiar with our business, so that our reporting is always spot on, giving us a view of the conversations and sentiment about our business on social media. They are valuable partners to us. Getclosure © 2019. All rights reserved.